Old Tolbooth Prison Edinburgh – Methods of Escape! The Old Tolbooth Prison in Edinburgh occupied a site in West Parliament Square outside St Giles on the Royal Mile. Until it was demolished in the early 19th century. The Tolbooth prison served two purposes. Primarily as ‘Death Row’ for those due to be hanged nearby within a few days. 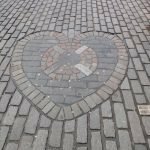 Also the entrance to it – nowadays marked in the cobbled surface which runs along the edge of the Royal Mile in the shape of a heart – served as a place where Edinburgh citizens paid their taxes. Hence the ‘tol’ prefix. The jail was known as being easy to escape from for those from the higher echelons of society. Books of an age exceeding 100 years are a fascinating source of true stories the world’s greatest fiction writers could not produce! Here are just a few. Almost every criminal of rank held managed to make his escape. Lord Burleigh, an insane peer, who about the time of the Union in 1707, had assassinated a schoolmaster who married a girl to whom he had made improper approaches. He escaped by means of changing clothes with his sister!! Another such escape that hatched was the escape of a prisoner in a trunk to be carried by a porter to Leith where he would be taken aboard a vessel about to leave Scotland. The porter however arranged the trunk on his back with the occupant’s feet uppermost. The head of the unfortunate man was therefore pressed against the lower end of the box. Upon reaching the Netherbow he met a friend who, upon hearing of the destination of the trunk enquired as to whether the job was good enough to warrant a whisky. They duly adjourned to a nearby tavern. The porter then thumped the trunk down with such force that the gentleman inside could take the pain no longer, screaming out and subsequently fainting. Upon hearing this noise, the porter burst open the trunk. He found the hapless nobleman in a state of insensibility. A crowd gathered and the City Guard arrived swiftly. The criminal quickly found himself re-incarcerated. Katherine Nairne attracted great public attention on being convicted of her crime. She was associated by marriage to some respectable families. She had poisoned her husband and had physical liaison with his brother, who was her associate in the murder. She was held in the Old Tolbooth. Her sentencing was delayed due to her pregnancy. For several days leading up to the jail birth of the child, Katherine Nairne and her midwife instigated a cunning plan. The midwife pretended to have extreme toothache. She came and went from the jail each day with her head enveloped in shawls and flannels. She groaned as if she were at death’s door herself with pain. The jailer became so familiar with this routine that he paid her no further attention. Katherine Nairne one evening came down in her stead, enacting the same routine, holding her head down upon her hands in supposed agony. The inner doorkeeper, not quite so unconscious of the trick as presumed, gave her a hearty thump on the back as she left and called her a howling old Jezebel. Katherine managed to refrain herself from response, instead heading straight into her awaiting coach. The coachman had orders from her relations that in the event of pursuit he was to drive straight into the sea I order that she might drown herself. A fate much preferred to the public shame of an execution. 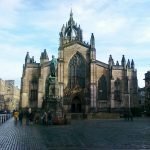 Hear more wonderful tales of an Edinburgh centuries past on a tour with me. See the main pages of this website.